Thanks to Life is Beautiful, Downtown Las Vegas’ art has burst from inside the buildings to their outer walls. Just when you think you’ve reached the end of the colors DTLV has to offer, you turn the corner and find new, bright street art and wall murals. Life is Beautiful started a project called Rise Above to bring groups of talented artists to Downtown Las Vegas every year. The artists pour their souls out onto our walls, then leave them there to be enjoyed all year. 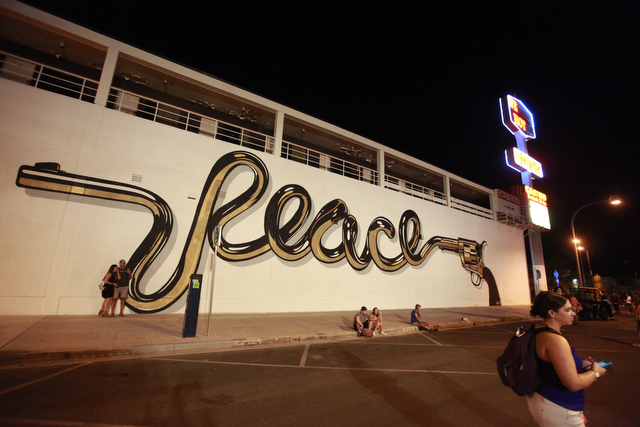 D*Face once covered a wall with a mural that read “Viva Lost Vegas” that felt perfect for the forgotten DTLV area. After that mural was accidentally damaged, the artist returned to give us something new. Peacemaker is a black and gold revolver with a long barrel that spells out the word “peace.” It feels more fitting for the space Downtown is now. No longer lost, it is regaining popularity. However, there is friction between those who have been there during the “lost” years and those moving in to experience it now. Street art is speaking for the Las Vegans. The wall murals that have been added to the city over the last few years do a lot to express the tension happening in Downtown Las Vegas right now. Citizens want to see things grow in a healthy way—a way that helps everyone in the area. Moving forward from a past established by organized crime families and a more recent history of “lost years” is complicated. Life is Beautiful and artists like D*Face help locals see their feelings expressed visually and move toward a more peaceful future. Let our guides show you all of their favorite street art on your next pub crawl. This series will hit the highlights, but Downtown Las Vegas is nothing if not filled with hidden gems. You won’t understand the feelings tied to the art until you are within it. Take a crawl to the best Downtown bars. Enjoy our drinks and our art. Las Vegas was born partying within the buildings we will take you and all of your friends to.